Fogs at Lake Baikal form corresponding to sea fogs: they correlate with the relatively consistent seasonal drifting of air masses and with the seasonal distribution of winds. However due to the isolated inland location of the lake and the influence of the surrounding continental landmass, the Baikal fogs are to be classified as a separate type of advection fogs of large inland lakes and water reservoirs. The number of foggy days is the highest along the Northeast coast of Lake Baikal, and the lowest in the Central and the Southwest parts of the lake. The fogs lie mainly in the curves of the coastline, bays, coves, mouths of the rivers, flowing into Lake Baikal, and the numerous creek valleys that open towards the lake. In the annual cycle, the fogs are most frequent in July. The Northern stations report higher frequency of fogs in summer and register a single sharp peak in July. The Southern stations report lower frequency of fogs in the annual cycle, while the annual peak is extended over June, July and August. 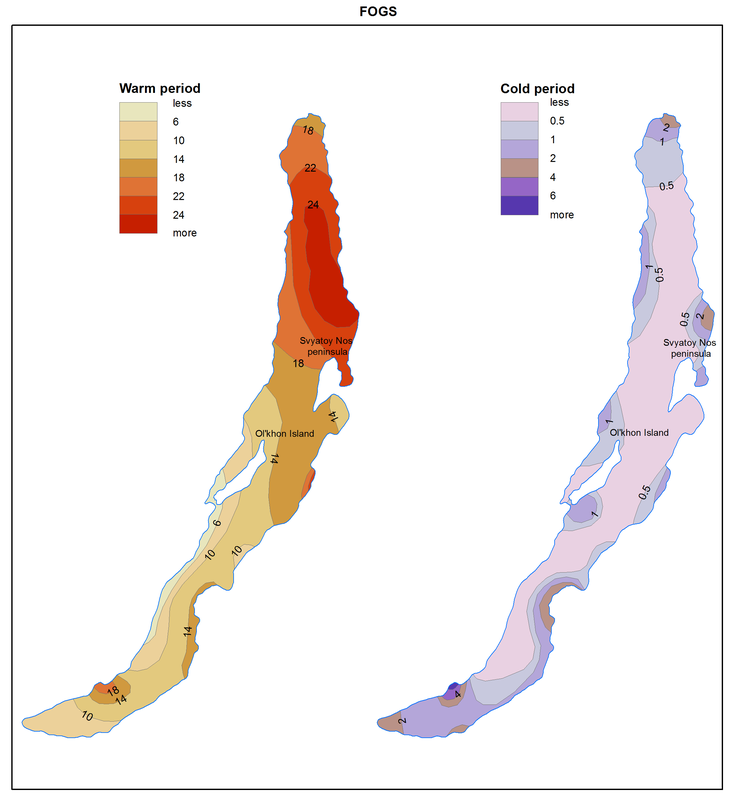 At Lake Baikal, condensation prevails in summer, and evaporation – in winter. In the warm season, fogs are formed by passing of a warm front, or within a diffused pressure field above the wet underlying terrain. These fogs are formed by condensation of vapor in a mass of air warmed up above the land as it passes over the cold water. Summer fogs are very dense and persistent, especially in the first half of summer. Evaporation fogs occur during the сold season. Until the lake freezes over, these fogs continuously stay above the water surface or can be lifted into low cloud. In winter, the Siberian Highland ground inversions accompanied by significant fall of temperature form radiation fogs. Winter fog formation is most commonly connected with advection of cold air over the warmer water surface. In cold season, as well as during the summer months, other types of fog can occur at Lake Baikal, caused by various reasons: temperature gradient between land and sea, the occurrence of floe patches and clear water surface, clearings in the fast ice of Lake Baikal. Forecasting Baikal fogs requires an integrated approach with attention to such factors as their movability and the complexity of their formation processes. One has to take into account the general meteorological situation, the character of breeze/monsoon circulation in the area, the influence of coastline. It is important to consider the influence of West winds on the fog formation at the East coast, especially in winter.